With another hectic show week behind us, we’re taking a look back at all of the newness that has us inspired for next season with a roundup of our top trends from New York spring/summer 2019 fashion week! Just like the season itself, spring designs breathe new life into collections, spotlighting fresh ideas and wearable pieces for the most daring bride to the more traditional and demure. This season brought us splashy new color trends, unique silhouettes, a return to traditional and even a play on the current pop culture climate! Scroll on for a few of our favorites, and be sure to take a look at our Instagram profile for more live-action photos straight from the shows under the ‘Runway’ highlight tab! 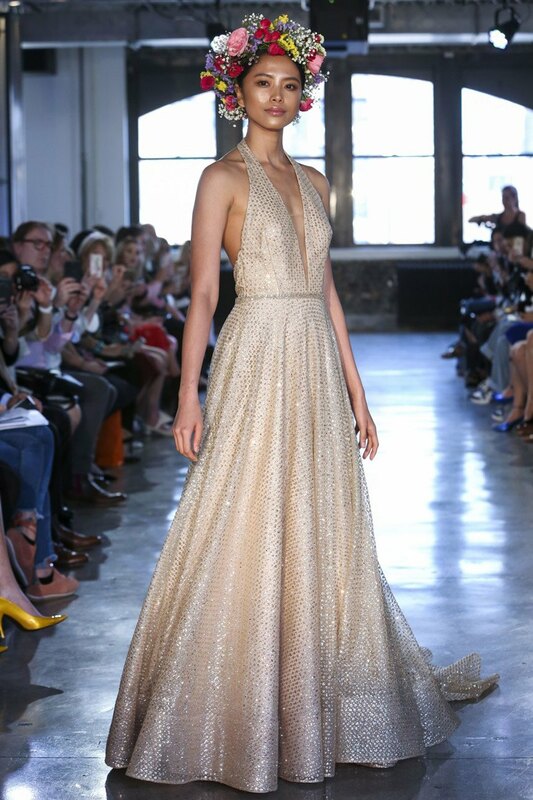 While recent seasons have introduced the idea of wearing color down the aisle, this season went straight for the gold in designs that glittered all the way around the runway! A subtle nod to the seventies made these standout looks feel slightly retro yet totally modern in silhouettes fit for the most glamorous of brides. We were totally smitten with this plunging neckline version from the new Wtoo by Watters collection, offering up a disco feel for a fun, fresh wedding day look! Be on the lookout for the arrival of the new collection in Julian Gold, Serendipity Bridal and other Watters lovelies at Unbridaled. With one highly anticipated royal wedding on the horizon, this season brought no shortage of gowns truly fit for the monarchy and certain to rival that of a particular UK Duchess title candidate, Meghan Markle. Full ball skirts abound, the fresh takes on this long-time classic wedding style feature unique necklines and fabrications while still retaining the ideals of a more Victorian-era look. 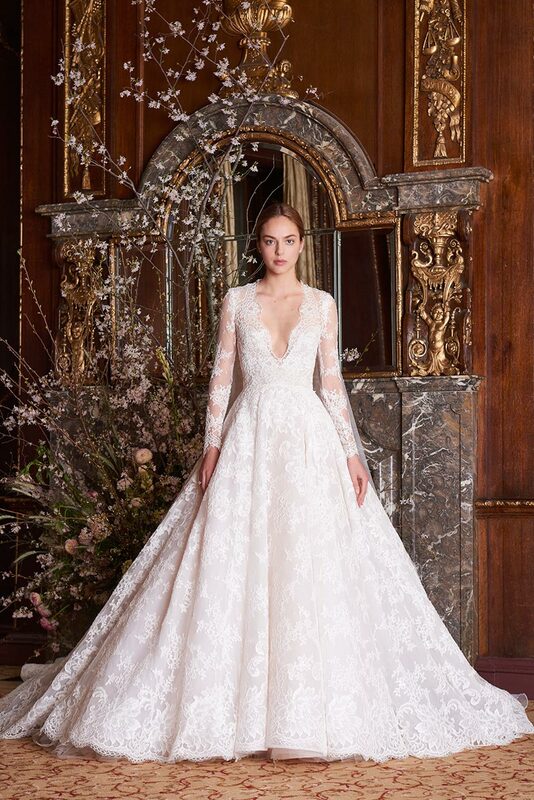 Monique L’huillier’s long-sleeved all-over lace version stole the show, and our hearts, with its resolve to maintain a look true to the grace, elegance and regality noted at every royal cathedral wedding! Find the new collection in stores soon at Julian Gold. 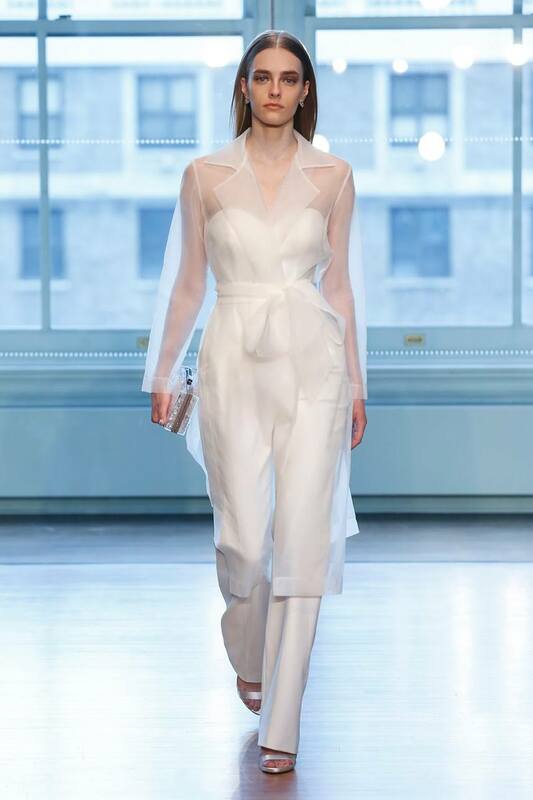 Hinting at this new-to-the-altar shape last season, Spring 2019 is two-feet in to the look of pants-as-dress down the aisle. A look for the non-traditionalist, jumpsuits are the easiest (and not to mention most comfortable) way to take ceremony to reception in style and hit the dance floor without a hitch! While some designers took on a more avant garde stance for the style, we adored the way Justin Alexander imagined the trend in a sweetheart neckline, relaxed fit through the leg and the ultimate topper accessory of a sheer jacket with sharp lapel belted bow tie for a look completely unique, elegant and fresh all in one. Be sure to look for style and the rest from Justin Alexander’s Spring 2019 at Blush Bridal Lounge. Looking for other trends straight from the runway? 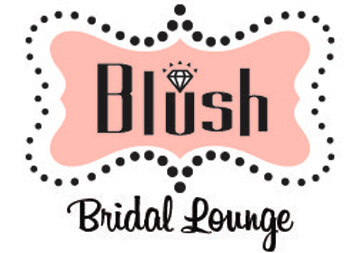 Keep a look out for the newest to hit our favorite local boutiques in the months to come at Beatitude Bridal, Julian Gold, Serendipity Bridal,Unbridaled and Blush Bridal Lounge!